Why don't we recommend Worcester Bosch boilers? I have personally been fitting gas boilers for 23 years, and in that time have fitted and worked on virtually all makes of gas boiler. Experience of the products is what counts to us and not what the company's rep can give. In my opinion Worcester is over rated and over priced. Whilst having a PR system second to none in my book that doesn't count for much. You will hear a lot of new companys\installers in the industry claim they are the best but it leaves me wondering where they have got that idea from.. glossy adverts??? The original CDi boiler was a nightmare to fit and a pig to work on, which was often. The Greenstar boilers which are still branded today are easy to fit but if anything goes wrong they are very costly for parts and not an easy boiler to work on. An example of this is the location of a pressure relief valve fitted to the boiler. This component is a safety device and must be checked once a year with the service. The washer inside the PRV gives after a while and its not unusual to have to change it, that is with all combination boilers. The job normally takes 30minutes and the part costing between £15-£30. A 30 minute job takes an hour and a half with extra cost for the HW section washers etc. I asked a Worcester rep about this when he was at a local merchants showing the Greenstar boiler. He looked at me bemused and said "it's not hard to remove, look"
He took it out in 60 seconds and smiled smugly. I laughed and said that the boiler was on a stand to which the back was open and so had easy access.
" Oh I've never heard any complaints before"
That sums up Worcester Bosch employees..
We don't recommend Worcester Bosch boilers because in our opinion they are overrated, overpriced, and a pain in the backside. Boiler not working during the winter months ? On occasion this is an easy fix that can save you the cost of a call-out. New condensing boilers create condensation inside the boiler that has to be taken away into a drain or wastepipe. During the cold winter months where the temperature drops below freezing the condense pipe (if run outside) can freeze up and cause a fault on the boiler. On a Vaillant boiler the fault code is shown as F28. On a Worcester boiler it's either an EA fault code, a D5 code or is displaying a flashing blue light. You can rectify this quite easily without the expense of an engineer call-out. Locate the condense line. It is normally outside on the wall that the boiler is situated. It is normally a white plastic pipe about three quaters of an inch in diameter. It should be running downhill from the point it exits the building to the drain or wastepipe. Boil a kettle full of water and run the hot water over the length of the exposed pipe. Be careful not to burn yourself with the water. If you do this a couple of times it will thaw the frozen fluid inside the pipe and allow the boiler to drain away. To stop this happening again, buy enough pipe lagging to cover the pipe. Make sure the pipe is completely covered and protected from the freezing temperature. What is the Gassafe Register? Gas Safe Register is the official gas registration body for the United Kingdom, Isle of Man and Guernsey, appointed by the relevant Health and Safety Authority for each area. Always check a gas engineer is on the register before employing them to carry out work for you. And when your engineer arrives on your doorstep, always ask to see their Gas Safe Register ID card before letting them in. 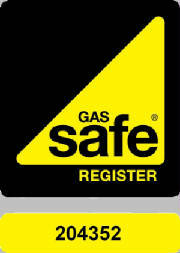 We are Gassafe registered and will allways show our card before actioning gas work.